A series of research articles in the British Journal of Obstetrics and Gynecology suggest that light-to-moderate drinking during pregnancy (up to 8 drinks per week) does not affect IQ , intelligence, attention, and executive function , selective and sustained attention , or general intelligence  in 5-year-old children. The study that produced the articles, conducted in Denmark, looked at the correlation between alcoholic beverage consumption during pregnancy and a number of outcomes in a group of more than 100,000 women and their offspring. Children of women who consumed low-to-moderate amounts of alcohol during pregnancy showed no difference in IQ scores compared to children of women who did not drink. Children of women who consumed more than 9 drinks per week, however, had lower total IQ and verbal IQ scores. Similarly, while low-to-moderate drinking during pregnancy did not impact the attention span of children at age 5, children of mothers who had more than 9 drinks per week were more likely to display lower attention span. These results suggest that low-to-moderate drinking during pregnancy may not be a problem, particularly when combined with the fact that there is no scientific evidence to suggest any other deficits or physical outcomes associated with similar levels of alcohol consumption during pregnancy. Still, because of ethical issues associated with conducting randomized studies of alcohol use during pregnancy, there remain no firmly established guidelines for how much alcohol is safe. An interesting finding of this study was that women in the various alcohol consumption groups (no alcohol, 1–4 drinks per week, 5–8 drinks per week, and 9+ drinks per week) showed little to no significant difference in education level or intelligence. The same is not true of many U.S. studies of alcohol consumption and pregnancy, which show that low-to-moderate alcohol use is more common in women of higher intelligence and higher education. Regardless of the study findings, U.S. organizations are not likely to change the official recommendations regarding alcohol consumption during pregnancy. The U.S. Centers for Disease Control and Prevention (CDC) and the American College of Obstetrics and Gynecology (ACOG) both urge women to avoid all alcohol during pregnancy, taking the stance that no amount of alcohol is considered safe. Women considering using alcohol in any quantity during pregnancy should discuss the results of these studies — and those of other existing studies on alcohol and pregnancy — with their obstetricians. Falgreen et al. The effects of low to moderate prenatal alcohol exposure in early pregnancy on IQ in 5-year-old children. BJOG. 2012 Jun 20. doi: 10.1111/j.1471-0528.2012.03394.x. [Epub ahead of print]. Kesmodel et al. The effect of different alcohol drinking patterns in early to mid pregnancy on the child’s intelligence, attention, and executive function. BJOG. 2012 Jun 20. doi: 10.1111/j.1471-0528.2012.03393.x. [Epub ahead of print]. Underbjerg et al. The effects of low to moderate alcohol consumption and binge drinking in early pregnancy on selective and sustained attention in 5-year-old children. BJOG. 2012 Jun 20. doi: 10.1111/j.1471-0528.2012.03396.x. [Epub ahead of print]. Kesmodel et al. 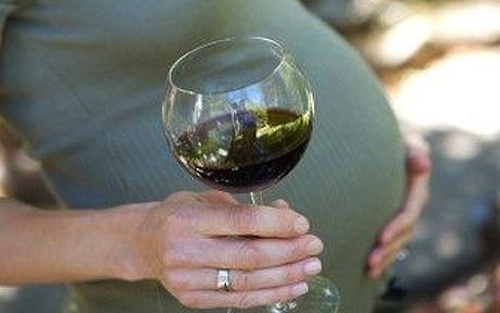 The effect of alcohol binge drinking in early pregnancy on general intelligence in children. BJOG. 2012 Jun 20. doi: 10.1111/j.1471-0528.2012.03395.x. [Epub ahead of print]. Kirstin Hendrickson, Ph.D., is a science journalist and faculty in the Department of Chemistry and Biochemistry at Arizona State University. She has a PhD in Chemistry, and studied mechanisms of damage to DNA during her graduate career. Kirstin also holds degrees in Zoology and Psychology. Currently, both in her teaching and in her writing, she’s interested in methods of communicating about science, and in the reciprocal relationship between science and society. She has written a textbook called Chemistry In The World, which focuses on the ways in which chemistry affects everyday life, and the ways in which humans affect each other and the environment through chemistry.